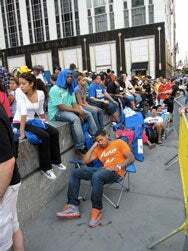 Muggy weather in New York greeted those waiting for an iPhone 4 Thursday. After a global launch that saw the iPhone 4 land in Japan, Germany, France, and the U.K., U.S. customers had their chance to get their hands on Apple’s newest smartphone Thursday morning. 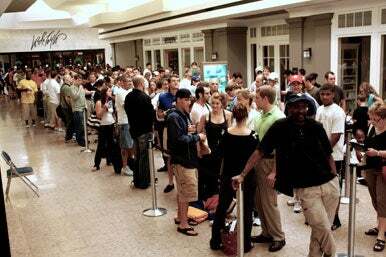 And, despite early shipment to some customers and limited iPhone supplies, the crowds still turned up at Apple Stores across the country for the iPhone 4’s official release. In New York, hundreds lined up outside of the flagship Apple Store on Fifth Avenue, with the line stretching for blocks amid a festive, if muggy atmosphere. But that same scene played out at other Apple Stores as well. In Farmington, Conn., the lines outside the Westfarms Apple Store stretched halfway down the mall where the store is located. According to General Manager Kevin Keenan, as of 7 a.m. local time “over 500 people” had lined up to purchase Apple’s newest iPhone. Surprisingly, both reserved and standby lines were equally long, curving and twisting around the mall’s second floor. 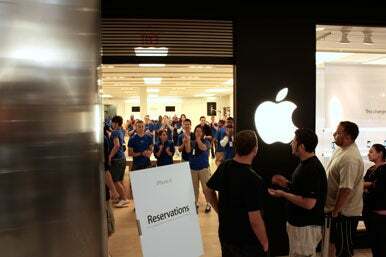 Hundreds of customers line up for the iPhone 4 at the Westfarms Apple Store in Farmington, Connecticut. Jerod Dikeman and Bill Brookshire, a pair of friends from Torrington, Conn., were the first in the reservation line—where they had been standing since 7 p.m. the night before. “Gotta be part of the party, right?” said Dikeman, gesturing to a series of Red Bull soda cans on the floor. The pair didn’t bring sleeping bags, “just soda,” and slept for a combined total of 45 minutes while protecting their coveted position. “Not too bad, we made some friends,” Brookshire said, glancing back at the rest of the line with a smile. Though she and her son had apparently been told they were to wait until 10 a.m. to get their hands on a new iPhone, employees came to get her shortly after 7 a.m. However, since her son hadn’t yet returned from a coffee run—“it’s a family upgrade,” said Pilares—she happily let the couple behind her take the first walk-in iPhone 4s. Apple Store employees welcome Jerod Dikeman and Bill Brookshire, who were first in line for the iPhone 4 at the Westfarms store. Sachdev showed up slightly after 6:30 a.m.—“I got a nice night’s sleep”—and proudly took the first spot in line at Radio Shack, across the aisle from the 300-plus who had lined up in the Apple Store’s standby queue. When asked if he planned on cluing in the standby line next to him in regards to Radio Shack’s phone availability, Sachdev shook his head, grinning. “Absolutely not,” he said. The iPhone 4 is available in 16GB and 32GB capacities for $199 and $299, respectively. The phone is initially available in black, with a white model of the phone delayed until July. The new phone boasts a redesigned form factor with an improved display, an enhanced camera on the phone’s back, and a front-facing camera designed to work with the new FaceTime video-conference feature. That will allow iPhone 4 users to talk face-to-face over a Wi-Fi connection. 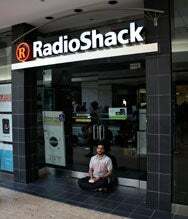 Neil Sachdev avoids the crowds at the Apple Store in the Westfarms Mall by waiting at RadioShack for his iPhone 4. “Everything has been upgraded, literally. It has a better look too,” said Joe Duffy, the owner of Fusion Health Services in New York City. Duffy had been standing in line outside the Fifth Avenue Store in New York since 4.30 a.m. the previous day to get his hands on an iPhone. The videoconferencing addition is the “wild factor” that differentiates the iPhone 4 from its predecessors, said Duffy, a New Yorker who was in line in New York to purchase the iPhone. He isn’t bothered by some perceived shortcomings, like a lack of Flash support. “My business Web site is in Flash, and I can’t see my own Web site, but it never really bothered me. I could see it on a laptop or … my desktop,” Duffy said. Customers waiting outside the Fifth Avenue store in New York had less-than-ideal conditions for waiting in line—muggy weather that had folks at the front of the queue dozing on lawn chairs and wrapping shirts around their heads to beat the heat. The line at the Apple Store snaked all the way around 58th Street, and Madison Avenue, ending halfway down East 69th Street. While the line was generally divided between those who pre-ordered and those who didn’t, by the end of the line, there was some confusion as to which was which, even for the Apple Store employees. “It’s kind of unclear right now” an employee told an arriving group of customers who had pre-ordered. At the end of the line stood Nick Badek, a concierge and business owner, and Dex Phillip, who owns a make-up company. Neither had pre-ordered, and both were unaware of the iPhone 4 shortages that have affected pre-sales “I’m pretty sure they’re stocked up very well here,” said an optimistic Nick Badek, who said he was most excited about the phone’s new camera and improved screen resolution. “We figure we’ll be in line for maybe two-and-a-half hours. That’s what they say, but also, you people make the wait longer,” Badek said, referring to the media covering the launch event. John and Kathy Ho celebrate their wedding anniversary with an iPhone 4 at the Apple Store in Manhattan. By 10 a.m. most people who had been in line since the day before had been served. Toward the front of the line, a restaurant server named Nathan waited with his girlfriend after showing up at 2.30 a.m. on Thursday. “I’m most excited about the front facing camera and the (extended) battery life”, he said. “FaceTime will help me keep in contact with my girlfriend when she’s out of town for long periods of time.” His girlfriend agreed. Emerging from the store with their new iPhones in hand were John and Kathy Ho from Manhattan, who had waited in line since 6 p.m. Wednesday to purchase their new iPhones as part of their 10th wedding anniversary celebration. They’re excited about the Retina display and better camera as well, which seem to be the favorite new features of most of the line waiters. Across the country, the weather was more co-operative in San Francisco where overcast skies greeted the customers waiting in line at Apple’s flagship store on Stockton Street. Several hundred customers were queued up outside the store in as congenial a mood as one can be after waiting in line for hours. Danny Kim had been in line at the Stockton Street store since 3 p.m. Wednesday, a spot that landed him near the front of the line. He was the first to come out of the Apple Store, however, and he was eager to try his new phone. “I think the gyroscope is very compelling,” Kim said. Alex Levinson was right behind Kim in line, but had different features on his mind. “FaceTime’s cool, but I’m not sure if I’d necessarily use it,” he said. Count Levinson among those impressed by the iPhone 4, though. “It feels like something Sony would make. It feels like a PSP,” he said, in a comment that’s unlikely to find its way into Apple’s marketing campaign. Dale Larson was the first person in line at the Stockton Street store, but he didn't actually stand in line the whole time. Larson, who got married on June 9, returned from his honeymoon after midnight Thursday morning. His friend, Erin Robbins, coordinated a group effort among Larson's friends to hold his number one spot early Wednesday morning. As it turns out, one of Larson's spot-saving buddies got an iPhone 4 before today. "I had to request that he not flash [the iPhone 4] around the line, inspiring ire from the surrounding audience," said Robbins. 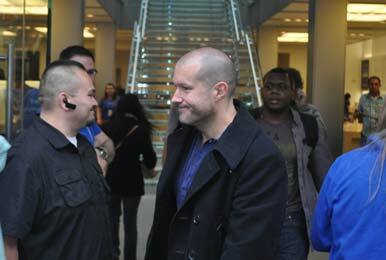 Larson probably had the longest, most elaborate journey to the Apple Store of all the people waiting in line. "I had lunch in Belize yesterday. I jumped on a speedboat to take me to a Cessna, which took me to my first Boeing, which took me to my second Boeing. Then, a limo took us from SFO directly to the line." Apple Senior VP of Industrial Design Jonathan Ive made an appearance at the Stockton Street Apple Store in San Francisco. Even the earliest risers this morning would find themselves halfway around the block at the Stockton Street store, as was the case with Kevin Ho, who arrived just a little bit before 4:45 a.m. For Ho, this event was his third time lining up for the release of a new iPhone. "It's been really fun. You get to meet people that you wouldn't ordinarily meet, and you also get to meet people who are like-minded. That's the really great part of it. It's more of a social event for me than anything else." Aside from the in-line wait being a fun social event for Apple consumers, Ho also noted that being at the Apple Store in person was the only way he could be absolutely sure he would get his iPhone 4 in his hands as safety as possible. "Being able to physically go to the store and get the box and be in that environment is a lot better than opening a FedEx box on my kitchen table." iPhones figure to be in short supply on Thursday. Apple says it took 600,000 pre-orders for the phone. By around 8 a.m. PT on Thursday, reports began circulating on the Web via Twitter that customers who hadn’t pre-ordered the phone are being turned away from Apple Stores. At the Stonestown Galleria in San Francisco, an Apple Store employee told a Macworld editor that the store would only be handling reserved orders for the rest of the day. Serenity Caldwell reported from Farmington, Conn. David Dahlquist reported from New York. Agam Shah of IDG News Service contributed to this report from New York. Macworld interns Blair Hanley Frank and McKinley Noble reported from San Francisco. Updated at 8:14 a.m. PT with more details from New York. Updated at 8:39 a.m. PT with reports of standby customers being turned away. Updated at 10:16 a.m. and 11:16 a.m. PT with comments from San Francisco.